The Hoover dam is approximately 45 minutes away from the Las Vegas strip at a distance of 33 miles from Las Vegas Blvd. As a day trip, this is a good diversion from the typical Las Vegas action as you will see some of the deserts of the Southwest and you'll be able to see a modern day engineering marvel. Before you start with Dam jokes you must know that a diversion away from the Las Vegas strip to the Hoover Dam will surprise you. Yes, you will still tell a "Dam" joke if you are traveling with your kids or if you still have the ability to be silly, but you will be impressed by the engineering, the scenery and the fact that outside of Las Vegas there are so many more things to see and do that don't involve casinos and cocktails. 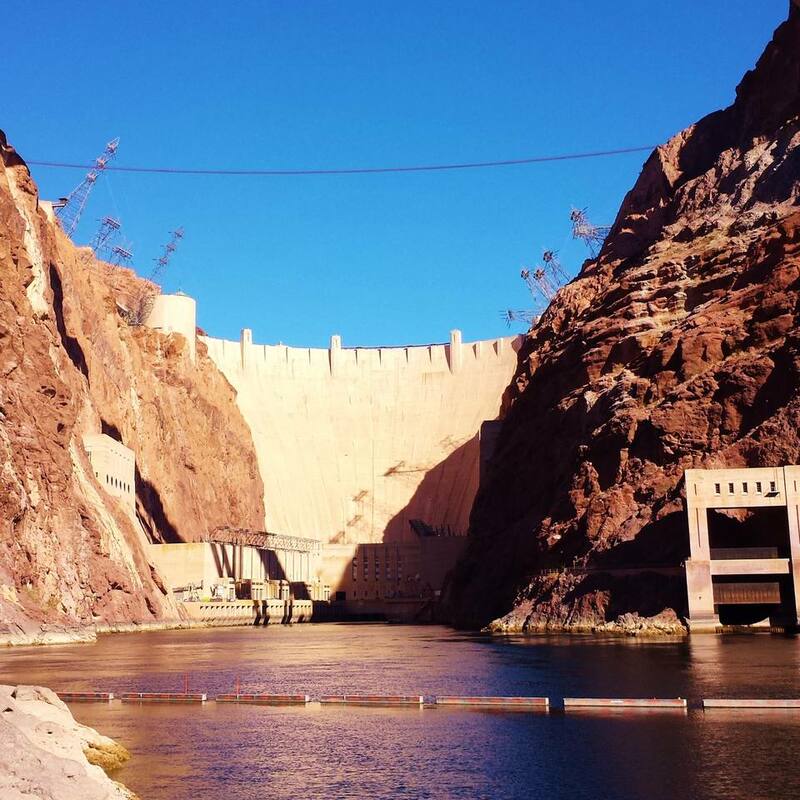 Located just outside Boulder City, the Hoover Dam is one of those places that you must see at least once because it is huge and it does have quite a bit of historical significance. When I say that it is big I cannot begin to explain how big it is without sounding like I am exaggerating. Let's just say that no matter where you are at on the dam you will look across and think about how much concrete it took to build it, how many people died while constructing it and how much water it holds back to create Lake Mead and you still will not have any idea of just how massive this thing is. It is an engineering marvel and a day trip is well worth it. Parking Garage: Open 8:00 a.m. -- Close 5:15 p.m.
First Powerplant Tour departs at 9:25 a.m.
Last Power plant Tour departs at 3:55 p.m.
First Dam Tour departs at 9:30 a.m.
Last Dam Tour departs at 3:30 p.m.
Last Visitor Center ticket is sold at 4:15 p.m.
Keep in mind that tickets sold from 3:45-4:15 p.m. are for Visitor Center Admission only. The Hoover Dam Visitor Center is open every day of the year except for Thanksgiving and Christmas days. My early memories of the Hoover Dam include taking the elevator down the concrete shaft that takes you to the base. The entire way my day would crack “Dam” jokes just to make sure I would not get nervous about the possibility of getting stuck midway between the top and the bottom. The Hoover Dam tour has changed but you still ride the elevator down through the concrete and this massive piece of human engineering is still incredibly impressive. Take an afternoon and try to picture what it would have been like to be part of the construction crew. It is well worth the drive from Las Vegas.